Crab, or for that matter, shrimp, scallops or salmon are not that easy to find on the prairie. Beef, on the other hand, is easy to find in all forms. But we love seafood, even though we've never lived near an ocean. Growing up, we would occasionally have boiled shrimp and salmon cakes and Thanksgiving dressing always had oysters in it. But seafood was definitely not on our weekly menu. Crab, scallops, clams and lobster were introduced into my diet as a young adult. I embraced seafood and would eat it as often as I could find good seafood -- either in the market or at a restaurant. Any good seafood on the prairie is hard to come by. Although we are in the middle of the country, we're far from any ocean (be it east, west or south). And when we do find seafood, it is often far dearer than we want to pay. But sometimes we just have to splurge. And since it is Christmastime, it's a good reason to splurge. So we treated ourselves to crab chowder. 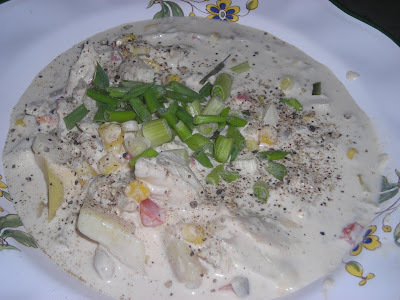 Full of fresh blue crab and cream, corn and potato, red onion and red pepper. 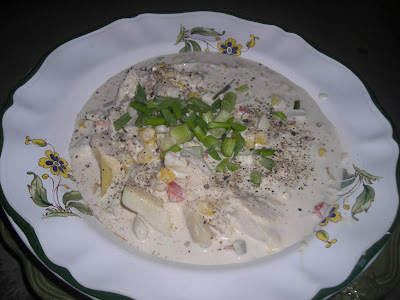 It was a cold blustery December day and a bowl of steamy crab chowder and some crusty bread made a wonderful dinner. That and a glass of chardonnay. Not so much a recipe as a pattern to make it. I used two potatoes that I had baked the evening before, peeled them and cut into chunks. I put the potatoes, about 1/2 cup of frozen corn, 1/2 of a small red onion, cut into small pieces and a red pepper in a small dice. All of these I put into a medium size Le Creuset Dutch oven. I then added a half pound of fresh blue crab meat and a quart of cream. I salted and peppered to taste and added a palmful of Old Bay seasoning. I heated all of it to just below boiling. Garnished with chopped green onion (both white and green) and a sprinkling of pepper. Golly, that sounds good! Now I've got the taste for chowder. You are a trouble maker. O Little Town of Bethlehem . . . The Packages Were Wrapped . . .